The Oscars are nigh. In around 5 days they shall be given out. There are plenty of awards to be given away but the most prestigious one is for the best picture and for no small reason too. In retrospect, the academy awards for each year are marked and called with the picture which won. Like 2008 was the year of No Country for Old Men and 2007 was the year for Departed regardless of what other pictures were made that year. But in this article I shall talk about those which are definitely not going to take the nameplate. It would be a titanic surprise if they do! This is the round of the most definite also rans! African American teenager whose life changes radically after he is taken in by a wealthy white family. Unlike other such movies it doesn’t try to cash in entirely on the emotional quotient but yet makes a strong impact by getting the story telling elements perfectly right. The performances in this movie just like the setup are natural and restrained. Everything and everyone just seems so right. Never would have I pictured Sandra Bullock in such a strong role. But she pulled it off really well playing a fine Christian woman from the South (Where the women of the family are generally strong willed and righteous). This role is similar to the stubborn boss she plays in her other movie of the year, The Proposal, but only much more central and powerful. Other than the every fantastic Meryl Streep who played Julia Child in Julie and Julia, she doesn’t have much competition for the Best Actress Oscar. Overall it is a must see movie, something which will moisten your eyes with happiness. As I had tweet reviewed it sometime back , An Education is a bildungsroman of an intelligent teenage british girl in the mid 60’s. Carey Mulligan who gives a fine lead performance saves this movie from being lost in a pile of hundreds of such other movies. It is about a young girl finding interesting company and yearning to get out of her stale life due to the vastly exhiliarating and educating experiences she has in the brief getaways. We know where these kinda movies head and this one is no different. It also has a strong undercurrent of the purpose of woman’s education and the attitude of the parents and society when she has found the right match. The supporting performances were as good as the lead’s especially those of Peter Saarsgard, Alfred Molina and the Rosamund Pike (she was funny). This movie seems to be in the Juno slot, for its demographic focus and the nominations it has garnered strongly remember the film I just mentioned. I can see no other reason this movie would get a nomination. This is at the rock bottom of the list. Another movie set in the 1960’s but this one is on the other side of the pond and has jewish focus. After the incredible prologue, it dives into being a mid 20th century mashup of conflict within duty, dream and religion giving rise to hell lot of doubts about life. 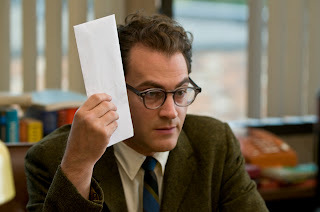 The movie is a caricature of an average Jews life and Michael Stuhlbarg portrays very well the victim of a crazy world where everything seems wrong and none due to his doing. The character evokes utmost pity and the settings, the conversations and the actions are funny with a layer of guilt. The Coens prove yet again their mastery of dark comedy and do ample with the script. Yet it is still so small. I didn’t even mention how much of a bore some scenes were and how some other were quite pointless. George Clooney. He is the heart and soul of this movie. A few moments here and there the character Ryan Bingham seemed like a reflection of Clooney himself, the lifestyle, the bachelorhood etc. Not that I know much about Clooney but it was a thought. Every frame is pitch perfect as long as he seems to be in it. He lives the dream in the movie travelling light in the matters of both baggage and heart. An amazing performance. I must also mention Anna Kendrick and her fine work as the novice in the firing industry who has got quite ambitious plans. She got an Oscar nomination for best supporting actress and I say it is well deserved. The sizzling hot Vera Farmiga did too and she wasn’t bad too. Jason Reitman makes a wonderful movie yet again from a book just like he did with Thank You for Smoking. He has got finesse in capturing the essence of the story and deliver it cinematically. I thought Thank You for Smoking was a great adaptation and this seems to be too. Reitman is the director to look out for in the decade to come! 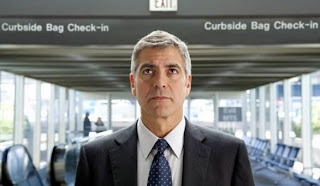 Up in the Air is a funny and touching drama which I cant recommend enough. As I mentioned before, 2009 turned out to be a really good here for some good science fiction. 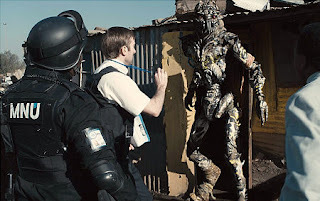 District 9 is as good as science fiction can be for the larger audience. It has got an off American location for starters which was quite a relief. Am really tired of seeing every Hollywood movie set in or starting from or ending up in the States. Even bollywood has more offshore stuff! The other good points being the aliens for once aren’t somehow so clever enough that they try rule our planet. There is some realistic estimation of how cohabitation would pan out to be; not much very different from the way we treat races of our own species. Set in South Africa and the creation of separate district did seem like a take on Apartheid but the problem is endemic to all civilizations all over the world and I don’t expect the conditions to be much different in case such aliens really arrive. The movie is gripping and bordering on hard sci fi with only problem or in a way boon being the absence of explanation. The documentary style narration of all that happens is fairly effective but loses track and consistency at places. It helps capture really well the human emotion and the fear and other responses that would arise in various scenarios from different types of people. The reluctant (un)hero , Van Der Merve is actually one of the best characters I have seen in recent times. All sci fi fans must have already seen it and I recommend it to other movie lovers too for it transcends stereotype. UP has also been nominated for the best animation feature and I shall review it with other movies of that category in a soon to come post. Up and District 9, though really good movies, fall in this category for they belong to genres which have been forever snubbed by the Academy members and it is highly unlikely they are going to win this year either for there are 2 or 3 really good movies which are real contenders and the folks at Oscar die for such stuff. Also this list is pretty huge because for the first time since 1943, the oscars have 10 nominations for the best picture. Also the method of voting this year has changed. But more about that later. Thanks for the review. Top on my list to watch were Hurt Locker, Blindside, Up. Ebert is a four letter word ! Could you double-check the envelope please?